What is Play & Why Does Play Matter? Play is essential to our human development, from birth to death. When you observe children, their single most important job is to play. Within the practice of play, humans explore their own imagination, their own sense of wonder, surprise, strength, grace, and joy. I believe that joy replenishment is equally as important as sleeping, bathing, and eating. Practicing play to replenish our joy is an experiential process where transformational learning takes place and fosters increased awareness of our physical, emotional, cognitive, intuitive, and imaginal intelligence. Play matters because it is were the imagination is given an opportunity to create and express through the gateway of the body. Play matters because it is essential to our human development from birth to death. The power of play has the ability to bring us into a state of focus and relationship. The purpose of play is to seek out joy for the sake of joy. Play brings us into embodied movement meditation through joy replenishment. Play subtly empowers us to connect with our own unique rhythmic expression, while influencing the trust within relationships and our communities. Dr. Stuart Brown, founder of The Institute for Play, states that "trust is established through play signals." Ultimately, body play empowers us to be seen uniquely as we are in this world, builds trust between human beings, replenishes our joy, and builds joyful communities. Are you practicing enough play in your life? Hoop dancing is an embodied movement meditation practice that uses body play as a powerful tool for joy replenishment, balancing the mind, body, and spirit. The hula hoop is described as a prop or a toy that has been used for play and therapeutic purposes (Camp, 2013). Although the hoop is a simple plastic circle, designed for all ages and sizes, people who connect with it have shared how the hula hoop has opened their lives up to a sense of balance, deep healing, and wellness. Believe it or not, hula hooping or hoop dance has existed for thousands of years. Hula hooping has even been documented as early as 1000 B. C. E., in ancient Egypt, where hoops were made from grape vines, and bent wood (Camp, 2013). In fact, the famous Greek physician, Hippocrates, known as the father of medicine, who placed emphasis on using the healing power of nature as a therapeutic approach to treating disease, would even prescribe hoop rolling exercises for healing weak backs (Camp, 2013). Hoop dancing requires persistence, present movement awareness, a positive attitude, and a openness to physical and imaginative exploration, discovery, while embodying a feeling of release or "letting go". 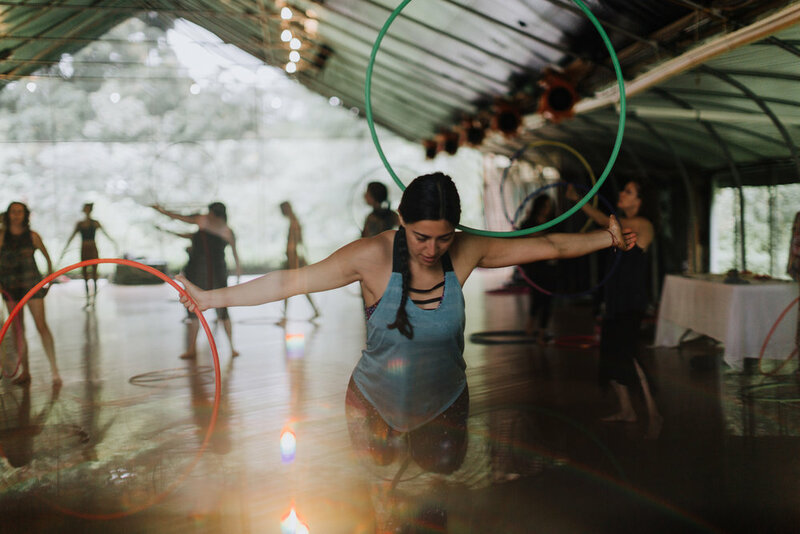 Many who have engaged in the art of hoop dancing have found that the space inside the hula hoop’s circle creates a tangible and visible boundary that provides and promotes a comforting sense of safety for self-expression. Hoop dancing has been described as a powerful movement meditation body play practice that invites more joy in the lives of those who practice (Camp, 2013). Hoop dancers often describe how hoop dancing facilitates a mindfulness presence where all planning ceases and the focus easily transitions into a powerful movement meditation. Meditation through movement, such as hoop dancing, is a holistic and dynamic body play practice that influences feelings of joyfulness and peacefulness through unique self-expression. So the question remains, can body play in the form of hoop dancing, serve as a powerful and therapeutic self-care practice for balancing the mind, body, and spirit through the invitation of joyful self-expression? I say YES! Hoop dancing is a simple and fun play practice that taps into the child-like joy within every single one of us and provides a safe place for exploration, discovery, and self-expression. Founder of The National Institute for Play, Dr. Stuart Brown is a Psychiatrist, teacher, and the inspiration behind my soul work in the world.